IHG® Rewards Club - Películas - C.H.U.D. Beneath the streets of New York city, there are hundreds of miles of subterranean tunnels unfit for anything human, unauthorized for anything experimental and unlikely to come to the surface...until now. Something horrible is loose in the sewers of Manhattan, and the city's homeless population has begun to mutate into 'Cannibalistic Humanoid Underground Dwellers.' 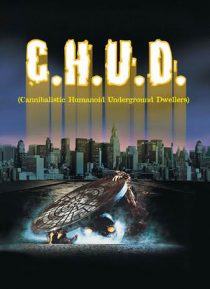 They are C.H.U.D. - hideous, hung… ry and headed for the streets!